One of my favourite commercially available film cameras has to be the Minolta X-300, so much so that when my much used X-300 finally gave up on life in 2014 I had to purchase another on ebay as soon as possible. 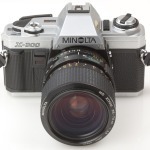 The Minolta X-300 is a manual focus metal bodies SLR released and sold during the 1980s featuring two shooting modes, full manual or aperture priority (by selecting ‘auto’ from the shutter speeds). The camera features a simple yet effective light meter with a visible LED reading on the left side of the viewfinder. In auto mode the light meter displays the shutter speed dependent on the aperture set on the lens. While using the camera in full manual what is considered the correct shutter speed for the set aperture is permanently illuminated with the manually set shutter speed blinking, this is ideal as it gives a good representation to the level of over or under exposure allowing you get the required exposure with ease while also learning to meter by sight. The Minolta X-300 requires 2x LR44 button batteries in order to operate, the camera will not operate at all without power. Being a primitive camera by today’s standards there are very few controls to learn with the Minolta X-300. Film advance: The film advance lever is situated on the top right hand side of the camera, perfectly situated to operate using your right thumb with ease. Shutter speed: The shutter speed is set using a small dial located under the shutter release button with the current setting showing through a small window on the top of the camera to the right of the hotshoe. Shutter speeds range from 1 second to 1/1000th of a second in 1 stop increments, also included is a ‘Bulb’ and ‘Auto’ setting. Shutter release: The shutter release button is located in the traditional right hand side on top of the body. Film release: Once you have reached the end of your film the rewind release is found on the under side of the camera towards the right hand side. Film rewind dial: The film rewind dial is located on the top of the camera on the far left hand side, the dial includes a small winder arm that folds out to enable rewinding film with ease. Film door release: In order to release and open the film compartment lift the arm on the film rewind dial and gently pull the dial upwards until the door releases and opens. Aperture: As with many 35mm SLR’s from this era the aperture is set via a ring on the lens. 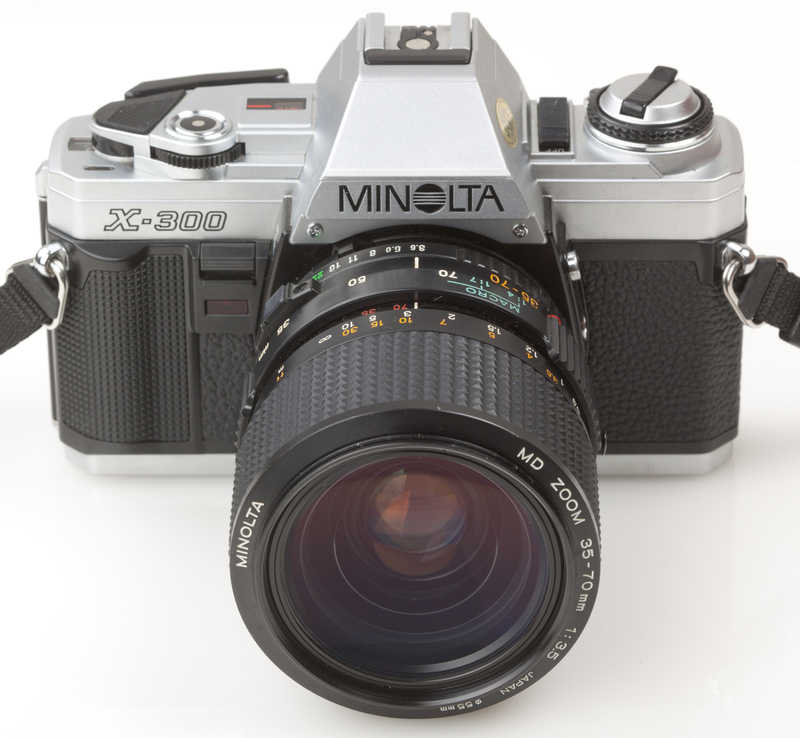 The Minolta X-300 accepts lenses using the SR bayonet system, many also refer to this as ‘Minolta MC’ or ‘Minolta MD’ which can be confusing when purchasing lenses as the terms ‘MC’ and ‘MD’ appear on many non SR lenses. Tamron also produced a Minolta SR mount for their Adaptall and Adaptall II lens ranges. At the time of writing (2014) I find that superb quality lenses can be purchased for exceptionally low prices, with my recent purchase of a replacement Minolta X-300 body came a Tamron Adaptall 35-70 macro all for the reasonable price of £12 including shipping. I have also purchased a few lenses in the past for this system in the under £20 price bracket which have worked and served me very well. The so called ‘kit lens’ that came with many Minolta X-300’s new and second hand was the MD 50mm 1:1.7. Don’t be fooled by the term ‘kit lens’ as unlike with today’s SLR’s the MD 50mm 1:1.7 lens is a very capable and well built piece of optics, allowing focusing from 18 inches to infinity and with aperture settings ranging from f1.7 to f22 in 1/2 stop increments (except for f1.7 to f2.8 which is done in one step), the MD 50mm 1:1.7 also features an evenly distributed 6 blade aperture system superior to the 5 blade systems commonly found on kit lenses of today, this gives a slightly shaped bokeh which is at least evenly spaced. The Minolta X-300 does not include a built in flash although does have a 2-pin hotshoe allowing the use of basic TTL flash units, although sync speed only goes as far as 1/60th of a second which is a little on the slow side, but easily usable. Included in my Minolta X-300 bag is the lower end Minolta Auto 118X flash unit which is a compact yet failry powerful flash unit allowing the use of the Minolta X-300 TTL system. The Minolta Auto 118X requires 2x AA batteries to operate. Many accessories are available for the Minolta X-300 camera, included in my Minolta X-300 bag is a Jessops M-1TR Power Winder allowing for automatic film advance after each exposure. The M-1TR Power Winder allows for single shot advance, continuous shot advance, an auto timer (5sec, 30sec, 1min, 5min) as well as the use of an electronic remote shutter release. As already mentioned the Minolta X-300 is one of my favourite 35mm SLR’s, although more likely my favourite camera of all. I have often stated that if I was given the ultimatum to sell all but one camera (god forbid) the Minolta X-300 would be the one I keep, even over my dSLR’s. I’m glad to hear that this information has been helpful for you. I’m sure you will enjoy the X-300; it’s a seriously under-rated camera, which I still use today. I have an opportunity to buy X300 for a really low price (like 10£) and I have two questions because I need to check by myself if everything works. How do I check the light meter? How does it work and where should I look for anything faulty? The second one is, I have a mini-collection of lenses for my Praktica PLC3 (really standard stuff). Will they work with the Minolta or do I have to buy some other lenses for it? I’m not an expert as you can deduce, but I really am trying to get better with all this stuff as it’s super interesting. The light meter is always on with the camera whether it’s in auto or manual mode, when you look through the viewfinder and lightly press the shutter release (but not all the way) one or two of the lights in the right side of the viewfinder will illuminate indicating the shutter speed that the light meter believes should give a good exposure. If the camera is in auto mode then the highlighted shutter speed in the viewfinder will be selected; if you have set the shutter speed manually on the camera then the selected shutter speed will be permanently illuminated in the viewfinder and the suggested shutter speed will blink. One other thing to consider with the X300, although it has a mechanical shutter it won’t fire at all without any batteries in it, they can appear to be broken when the batteries are dead. If the PLC3 is similar to the MTL3 it will use M42 screw mount lenses, adapters are available to convert these for use with the Minolta bayonet mount although I believe you will only be able to use the lens wide open as the aperture pin isn’t easily converted to the Minolta system. Hope all goes well as a good condition X300 can be worth it’s weight in gold.